KDE has developed a number of very interesting and powerful technologies, libraries and components but there is no easy way to show them to other people. See "A wish a day: KDE Demo" for more details. Something like Qt Demo but with KDE technologies. C++ is the main language of KDE, therefore the demo should be in C++. The more you know about C++, Qt, KDE and scripting (for Kross and KDE bindings demos), the better. This idea encompasses so much different stuff the student is not expected to know everything before he starts coding (but will certainly know a lot when he's done!). Mentor: Pau Garcia i Quiles as general mentor and someone to ask for directions. Specific help for each technology will probably require help from its developers. A similar extention exists for Banshee: http://nloko.ca/?p=19 Compatibiltiy with this would be big plus. So when not at home so the laptop is not connected to the NAS you won't see #2. Mentor: Someone from the Amarok team with in depth Collection knowledge. Contact Bart Cerneels (Stecchino on #amarok) for details. Mentor: Someone from the Amarok squad. Brief explanation: gpodder.net is a Webservice that allows Users to synchronize their Podcast Subscriptions and Episode Status across different Devices. Amarok already contains a basic gpodder Service (used to display a Podcast Directory) and most API Calls of the Webservice can be accessed via libmygpo-qt. Your task would be to synchronise Podcasts & Episode Status in Amarok. User subscribes to a Podcast via the gpodder.net Webservice. Amarok sees this new Subscription and adds it to the available Podcast Subscriptions. Things that could be included: the background (color, gradient, a photo), the particular frame layout and maybe the possibility to add some text. Once the template is finished, the only thing is to intuitively add photos to the frames (maybe with drag and drop?). Of course the photos don't have to completely fit in the frames, so they would be scaled to fit in one dimension and the final user would have to select the part of the other dimension to crop the photo in the frame, if necessary. This could be a very nice feature also for Gwenview. Expected results: add a new tool for photo frame layout. Mentor: Somebody in the digiKam team or maybe also Gwenview team? Extend the framework to handle proper styling of GeoGraphicsItems (so that outlined streets and colored areas are possible. Handle text display in a basic way. Expected results: Colorful mapnik-style rendering of .osm files. An improved GeoGraphicsView framework that can handle styling. Features for mobile use cases (e.g. Geocaching). Expected results: A better mobile experience of Marble (e.g. on the N900). Expected results: A full optimized rendering of the Natural Earth map as vector rendering by using and extending Marble's existing classes. 1. Investigate possible replacements for KStars' in-house computation, like libnova. It is important to keep KStars cross-platform. Hence we should look at cross-platform replacements. 4. Write test cases to ensure that the computations are correct. 6. If time permits, write an interactive command-line client / python module / D-Bus interface to use this library. This is a difficult project, and requires a good deal of patience and endurance ;-). Probably not everything on this is achievable within the time-span of a GSoC, but this is the ultimate goal of a project like this. 1. Move all computational code from SkyPoint and SkyObject into a bunch of classes. Get these object classes to use the new class for all computations. These computational classes should have access to a copy of KSNumbers, KStarsDateTime, GeoLocation and other paraphernalia. 2. The Sun and moon are rather important for a lot of calculations. Create a separate class to answer computational questions about the sun. Replace the current use of KSSun / KSMoon to perform computations in a lot of places in the code by references code that uses this class. Expected results: Clean, restructured code for KStars, which now uses a library that can be re-used in user-written scripts etc. 1. "Smart" assignment of observation times to objects (accounting for time taken to observe each object) -- currently, the observation planner can make a timeline of objects to observe during an observing session (Fire up KStars, hit Ctrl + L). However, this is done by just stamping the time of meridian transit. That may not be reasonable in a real observing session, because it takes some time to view each object. A possibly smart way of assigning times would be to account for the time taken to view each object and then assign times by sorting the objects by RA first and then by abs(declination). 2. A time-line view for your observation session plan, on which you can drag objects around to set observing times -- it would be great to have a time-line on which each object to observe is a slider. The time of observation of the object should be changeable in discrete units by moving the slider. The other objects' times should "re-adjust" to accommodate the change. 3. Ensure compatibility with OAL 2.0 XML schema is perfect -- We use the OAL 2.0 XML schema, which is gaining on as a standard format for observation log and observing list exchange. However, OAL compliance is not 100% and needs to be polished and tested. 6. Clean up the Execute Session interface. Fix bugs. 10. Add the ability to publish observation logs on a server. Expected results: A better observation planning and logging feature for KStars. Brief explanation: KStars can currently print rendered images of the sky. But they are not well-annotated. The aim of this project is to write code that will print star charts from KStars with explanations and annotation, and also print observing lists. Here is our idea of the project. Feel free to come up with different feature ideas and different implementation ideas. Creativity is highly encouraged. 1. Create printed finder charts with Annotations, Multiple Fields-of-View, Legend etc. The idea is to produce charts for three different "zoom" levels around the same point in the sky. Or even better, improvize and use the star hopper code (See tools/starhopper.h) to find out the coarse, binocular and fine fields of view. 3. If time permits, use an OCR library to permit conversion of printed forms into OAL-compliant reports to the best extent possible. Creating a legend should not be very hard. Look at SkyMapDrawAbstract::exportSkyImage(). This draws a sky image on a QPaintDevice. One way to add details would be to use a QPixmap or whatever is appropriate as the QPaintDevice and then embed that in a larger QPaintDevice with the legend, title etc, and then add annotations. Creating multiple FOVs could be a challenge. Look at the relevant parts of the code (SkyMapDrawAbstract::exportSkyImage(), SkyMapComposite::draw() etc). We encourage clean solutions to this in the proposal. 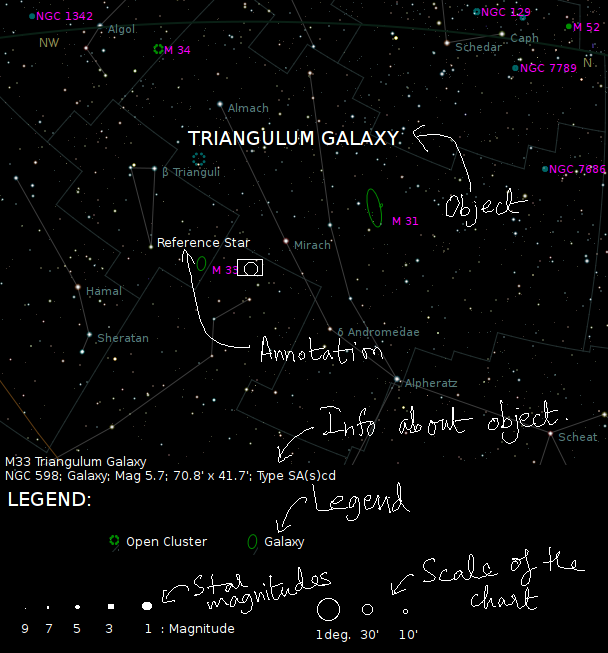 Also look at the Star hopper feature which can be accessed by right clicking on the SkyMap. Watch the console for debug output since this feature is still very experimental. 1. Plate solving and mapping of images: Look up astrometry.net. They have a library that can identify and produce the celestial coordinates of all objects in any given photograph of the sky. Use KStars to provide an interface to astrometry.net, and display plate-solved images on the sky-map. Use texture mapping to do this in OpenGL mode. 2. Retrieving scientific data: Make retrieval and visualization of data such as spectra of stars, variable star light curves etc. easy through KStars, via some simple GUI tools that initiate queries on various websites. 3. Astronomy updates: Monitor websites for updates such as comet, asteroid and supernova discoveries and alert the user about such events. (Maybe) keep updated catalogs of currently observable comets, asteroids and supernovae. Expected results: KStars is more usable for the scientifically inclined user. Expected results: All new features that will definitely get into C++0x are supported in the parser. Correct DUChain integration is added and code completion works as expected. Expected results: Integrated running of CTest suites with all the features one would expect from an IDE. Create a wizard to add new tests, with CMake integratoin and support for QTestLib for starters. Should be extensible in future. Expected results: It would be interesting a project regarding improving VCS integration in KDevelop by improving/providing new visualizations and UI so that the user has a better control on the system. Brief explanation: Polish XDebug and it's dependencies, improve PHP language support plugin. Expected results: Make the XDebug plugin work and bring it and its dependenciees into a releasable state. Improve PHP language support plugin by fixing the Namespace support, adding basic code completion for array keys, and hopefully other things. Brief explanation: Transferring files in KIO currently has three significant limitations. First, it scans every directory before transferring any files, which is slow for large numbers of files and directories. This process also tends to hang for very large numbers of files. Second, it stops on all errors, which means the user has to monitor the transfer. It also provides no report on the errors at the end or any way to go back and check those files. Finally, transfers happen in parallel, which can lead to excessive disk I/O activity or network traffic, slowing down all the transfers. The purpose of this project would be to fix these problems. Expected results: Directory scanning and the actual file transfer should happen in parallel. Errors should be handled in a more appropriate manner, with the response depending on the error in question. The exact response to each error should be worked out with the mentor. A report on all errors should be available at the end of a transfer. Finally, there should be some method to merge multiple transfers, perhaps on a per-filesystem basis. Brief explanation: The Common Print Dialog is an initiative by the OpenPrinting workgroup of the Linux Foundation to build a common fully featured print dialog for the Linux ecosystem. KDE is currently working with OpenPrinting to complete the dialog in a manner suitable for use in KDE and Qt. OpenPrinting is able to offer a number of GSoC slots for working on completing the dialog itself, integrating the dialog into key KDE applications, and integrating the KDE Color Management system into the dialog. Please see the OpenPrinting GSoC page for more details on these tasks. Have a look at last year's ideas as well. Brief explanation: Social networks are quite popular with many people, therefore KDEPIM should be able to extract data from the social networking sites. One example is the facebook resource, which makes friends and events available in KDEPIM. A vast amount of other social networks exist, many of them, like LinkedIn, StudiVZ and MySpace, use the OpenSocial API to provide access to their data. The goal of this project is to implement an Akonadi resource for OpenSocial networks. Expected results: A working OpenSocial Akonadi resource that supports at least contacts and messages. Brief explanation: HTML mails are used more and more frequently, it is therefore important that KMail has good HTML support. Sorely missing at the moment is the ability to preserve HTML formatting while replying to a mail, which would be one of the main goals of the project. Apart from that, the existing HTML support should be polished. Expected results: The ability to reply and forward HTML mails and keep the formatting. Brief explanation: VOIP installations are used in many places, and need to be managed. One popular VOIP framework is Asterisk. The goal of this project is to provide a Kontact plugin or a standalone application that can manage as many aspects of Asterisk as possible. Brief explanation: The wallet is used in many places in KDEPIM, for example when checking and sending email. Some users disable the wallet, which means in all places there is an implementation of an alternative password dialog. This should be merged with the KWallet API, so that it is possible to always use the same API. Additionally, this project should add a pinentry implementation that uses KWallet. Pinentry is the password dialog program that is used when doing crypto operations in KMail. Brief explanation: There is already a vast information for each contact available in KDE: The addressbook entries, chat logs, tweets, e-mails, Facebook messages and so on. The goal of this project is to create a person-centric view that shows all this information about a person, with a nice way to search and examine the data. It should also be possible to initiate communication with that person in this view. Expected results: A Kontact plugin that shows all available information about a person and provides communication abilities. Brief explanation: With Akonadi, contacts come from many different sources, for example from your personal contacts resource, from the facebook resource or from the KDE accounts resource. Often, the same person is present in multiple resources, causing duplicates in KAddressbook. The goal of this project is to automatically merge contacts from multiple sources into a metacontact that aggregates all information. A possible implementation concept has been covered during the last PIM meeting. Brief explanation: There are multiple way to sync a mobile phone with a computer, for example SyncML, OpenSync or ActiveSync. The first two already have a first implementation, but are still work in progress. Make one of the solutions fully work. Expected results: A full solution for syncing mobile phones with Akonadi, which should include a GUI that is easy to use. Knowledge Prerequisite: C++ and Qt should be known already. Brief explanation: Exchange is an important groupware server used in many businesses, support for the protocol would make KDEPIM much more attractive. Open source client libraries for Exchange are already available from the OpenChange project, and a prototype OpenChange resource for Akonadi is also available. The goal of this project is to complete the OpenChange resource. Expected results: A working OpenChange Akonadi resource that supports mails, contacts, events, free/busy support and sending emails. Brief explanation: When migrating away from Microsoft Windows, mail users often have large "archive" folders in PST (Personal Storage Table) format. It would be useful if these could be accessed through Akonadi. There are a couple of libraries available that could support this type of resource. Expected results: A working PST Akonadi resource that supports mails, contacts, events, free/busy support and sending emails. Brief explanation: Google provides popular services for mails, contacts and calendars. Those are already supported in KDEPIM, mails are supported with the IMAP resource and there are also resources for contacts and calendars. Yet, these solutions are not fully polished yet, many problems for all three are reported. The goal of this project is to bring support to a prime level that works for users out of the box. Among others, it means supporting Google Mail labels as tags in Akonadi/Nepomuk. Expected results: Flawless support for Google Mail IMAP and a google data resource that fully works without bugs. Brief explanation: While KMail is powerful, the user interface can be improved in many places to make it easier to use and look more appealing. One of the goals is adding tab support for the preview pane. Apart from that, the student should suggest other UI improvements, for example by taking ideas form the bug tracker or from other mail clients. These UI improvements should not be adding new features, but making the existing UI better. Expected results: A tabbed message preview pane and various other UI improvements. Brief explanation: The preview pane in KMail should optionally be able to show all messages of a thread at once, which is also known as "conversation view" and popular from the Google Mail web interface. The message list probably needs a special mode that makes it more suitable for using conversation views. Expected results: A smooth conversation view mode that not only adapts the looks of the preview pane and the message list, but also delivers a good interaction workflow. There needs to be some thought on UI and interaction design behind this to create great usability. Brief explanation: KDE is unique in the Linux eco-system in providing support for alternative calendar systems such as Hebrew and Islamic calendars. However, Kontact and all the open standards for PIM only support the Gregorian calendar system. This project would explore ways of supporting alternative calendar systems in Kontact and in the wider open PIM standards world. Knowledge Prerequisite: Some C++ and Qt recommended. Some knowledge of the cultural use of alternative calendar systems. Strong research and design skills, getting the iCalendar and vCard storage and interoperability definitions correct is the most important part of the project. integrate into textshape so not only Calligra Words can profit (reuse the notes functionality). display notes in Calligra Words on the left/right side of the page-textshape. see ODF 1.2 specs "6.3.2 <text:note>" and "6.3.3 <text:note-citation>" and "6.3.4 <text:note-body>" and "7.7.7 <text:note-ref>" and "16.29.3 <text:notes-configuration>"
see also the bugs 260138 and 260184 and 260102 and 260127 and "Post-it" area + notes as a GSOC?. Brief explanation: The Krita file format is quite simple: a zip container with XML describing the image and easily parsable binary data for the layers. This project entails creating commandline tools to change colorspace and channel depth of krita files, split out krita files into the component layers, apply icc profiles, transpose layers, and compose files from other krita files and more. Stage is an easy to use yet still flexible KDE-based presentation application. Brief explanation: The presentation view in presentation applications is used in multi-monitor displays to display information about the presentation on one screen while the full slides appear on another screen. This provides information to the presenter that is not visible to the audience. This information often includes a preview of the current and next slide, timing information, notes, and a list of slides for navigation. Stage already has a basic presentation view, but it is fairly limited in its capabilities and rigid in its layout. This project would be to design a new presentation view for Stage using plasma, ideally using QML-based plasma widgets. It would involve developing a plasma containment for the presentation view and plasma widgets for the individual elements needed by the view, as well as an interface for setting up the view. These elements would, at a minimum, include: a preview of the current slide, a preview of the next slide, a list of slides, notes for the current slide, next and previous slide buttons, and a timer. Users would need to be able to place, position, and resize the elements. The presentation view would also need to support multiple different views that could be easily switched between during a presentation. Brief explanation: Unlike normal slide-based presentation tools, single-canvas presentation tools have a single infinite canvas. Parts of that canvas are set of as frames, and the presentation progresses by moving from one of these frames to another in a pre-defined or arbitrary manner. Alternate routes between frame scan be defined, as well as branch points where the presenter can select between multiple different ways to proceed from a given frame. This allows for a non-linear presentation. This project would involve implementing a single-canvas presentation mode in Stage. Users would need to be able to set up a canvas, set aside parts of that canvas as frames of arbitrary size, set paths between those frames (including a default path and alternate paths selected by clicking on elements in the presentation), zoom out to view the entire canvas, and zoom in on arbitrary parts of the canvas. Brief explanation: Stage currently has three different, independent tools for managing slides: the Document Panel, the Slide Sorter, and the Custom Slideshow Editor. These use completely different interfaces and have different capabilities (for instance only the Slide Sorter has drag-and-drop). However, they are all used to manage slides in your presentation. This project would be to combine them into a single interface. The interface would normally reside in a docable panel similar to the existing Document panel. By pressing a button, it will expand to take up most of the window, behaving as the Slide Sorter. In this mode, there should be an additional, normally hidden panel at the bottom that the user can use to create add and remove slides from custom slideshows. In the process, the existing Document Panel and Slide Sorter should be modified to take better advantage of features provided by KDE and to provide better consistency with other KDE programs. Changes would likely include: overlay buttons when you hover on a slide, drag-and-drop interfaces, menus on drag-and-drop, and selection effects similar to those seen in KDE-based file managers. As Calligra is quite powerful it is easy to add plugins to it that then can be used by all Calligra applications. Support for loading and saving into odf is also needed and should be compatible with OpenOffice. Additionally it would be nice to enhance the MS Office filters to convert "Wordart" to Fontwork when loading. Brief explanation: One lands up working on various different projects. It would be beneficial if Nepomuk could keep track of Projects. This would include remembering which files were involved, the people involved, TODO lists, etc. One of the most important aspects would be a form of browser integration, as research for a project is primarily done through a browser. There should be ways to annotate web pages, bookmarks, and even selected parts of a web page. Create a project by the name of web-scrapper. Create its git repository. Nepomuk should understand that this is a coding project and here is where the source code would be. Maybe it can even store the source code management software's name. Read up about Python web-scrapping and bookmark some pages. These pages are given tags like "Python, Web-Scrapping, Manual, Talks" and are associated with the project. Download and watch one talk related to Python. Again Nepomuk should link the video file with the project. Add TODOs and other stuff for the project. Maybe this project is being done with someone. The project should be linked to that person. Expected results: A backend for project management, and a nice GUI to manage them. Knowledge Prerequisite: Qt and KDE development experience. Some knowledge about RDF and NRL would be nice. Brief explanation: Classical bookmarking means to simply put a link with a name into a hierarchy of links with names. The idea is to bookmark web pages by linking them to projects, tasks, persons, files, by tagging them, by commenting on them, and so on. A simple way to annotate web pages in Konqueror or rekonq, to tag them, to relate them to resources and so on. This could be realized with a side panel, a popup menu, toolbar buttons, hotkeys, whatever. A way to open web pages by finding them through the annotations. A side panel seems a good first approach but there might be better ways. The side panel could provide two ways to find pages: 1. a simple search and 2. a display of pages related to the currently browsed page. The latter could be based on existing relations but also a keyword search of the current page using Scribo. Knowledge Prerequisite: Qt and KDE development experience. Brief explanation: Currently Digikam uses its own database to store image metadata, ratings, and their own brand of tags. In addition it comes with a Nepomuk service that syncs some of the information with Nepomuk. The idea is to take full advantage of Nepomuk, store all information in Nepomuk, and implement additional fancy features on top of it. Expected results: The result of the project should be two-fold: 1. a replacement for the current Digikam database with Nepomuk, 2. additional features based on Nepomuk. The latter includes listing of all photos from Nepomuk instead of the configured folders (or a combination), photo album creation through Nepomuk resources instead of folders (Each Album is a resource in Nepomuk with links to the photos in it - this allows for one photo to be in several albums without physical copies or symlinks), commenting of albums, and listing of albums or photos by other criteria though Nepomuk queries. Knowledge Prerequisite: KDE experience would be preferred. Brief explanation: Nepomuk allows to store all kinds of metadata for files. Some of this metadata like id3 tags of mp3 files could be written back to the files. See also the corresponding wish item. Expected results: A service or an extension of the Data management service that allows to write back certain information to the files. This writeback should be triggered by the metadata change in Nepomuk. It would be nice to have a plugin system that allows to add new formats for writeback easily. Knowledge Prerequisite: C++, basic Qt or KDE is always nice but not necessary. Brief explanation: The flexibility of the Plasma Desktop shell can bring desktops fine tuned to a particular use case: With the KDE edu project, KDE has a strong offering of educational software. To further leverage the stength of the KDE platform, a customized Plasma desktop for the educational environment can make KDE the obvious choice. Expected results: A set of plasmoids and a custom plasma layout (with eventual modifications to the desktop shell itself) to do a strong customization. In designing those plasmoids, the mobile use case has to be taken into account as well. Brief explanation: There are several things that needs to be done in both designing and preparing libplasma for the next major redesign. Expected results: A thing can be building a working branch on git that doesn't have any derecated class of functions and is completely without widgets (so will be unable to load classic c++ plasmoids) but that can still load qml based ones. Brief explanation: Develop (and polish the ones already started) components for a classic mobile ui, such as application laucher grid, plasmoids container, notifications and systemtray plasmoid and so on. Expected results: A quite classic mobile shell at a near production quality, while alternate containments and plasmoids will make posible to experiment new and more radical user interfaces. Brief explanation: Home automation services need and can be very powerfull with an integration in desktop, this project aim to provide UIs and configuration tools for an home automation server like Domogik¹ with the help of Plasma technologies. This project need to identify and discuss how to implement these concept and do links with Plasma Media Center or others part of desktop. Expected results: A set of plasmoid dedicated to supervision and contorl of a house, a way to ajust advanced parameters (perhaps with an abstraction layer for help future implementation of other automation server). Brief explanation: Activities are growing up to bi much more than different 'desktops'. Programs (from KDE and 3rd party) should start talking with the activities service to provide the info about the documents (and web pages, filesystem locations, etc.) they access, modify. Expected results: Patch all main KDE apps to do the above (including KRunner and similar). Modify Places, Bookmarks models to show different stuff when in different activities. Provide a KIO for browsing files per activity and date/time, and a runner which will favour apps/documents with high rating calculated from the usage stats. Knowledge Prerequisite: C++, Qt. Nepomuk and Zeitgeist a plus. Brief explanation: QML is the new declarative user interface description language for Qt. Unlike the traditional widget based design approach it works on an underlying graphics scene requiring painting within that scene. Phonon however depends on the presence of a widget to do video painting. An alternative painting architecture needs to be introduced to permit tight integration with QML and QGraphicsScene based applications such as Plasma. Ideally using different approaches (e.g. paintaing using OpenGL shaders and surface painting using QImage/QPainter). Knowledge Prerequisite: Qt/C++, plus for QML, OpenGL, GStreamer and libvlc. Brief explanation: Phonon currently has the capability to easily read any audio or video format known to the backend. This results is a very large number of supported formats. Many of the decoders in the backends also have a corresponding encoder. Phonon also recently acquired the ability to record from audio/video devices. It then makes sense that someone would want to use Phonon not only as a playback framework, but as a recording framework. A use case for this would be writing a simple application to use Phonon for recording a video from a webcam and microphone and immediately writing a .ogg file for later upload to a website such as Youtube. Alternatively, the encoded .ogg data can be sent to libshout and on to an icecast server for internet radio. Expected results: Phonon gains a new kind of MediaNode that accepts media data as input and generates an encoded stream available as a QIODevice. Essentially, the inverse operation of an AbstractMediaStream. Knowledge Prerequisite: Qt/C++, plus for GStreamer and libvlc. Brief explanation: With the increasing availability of multi-channel sound cards (more than 2 channels) and the popularity of surround-sound movies, having a tool to properly configure and calibrate surround-sound speakers is essential. However, Linux in general lacks a good surround-sound configuration GUI. This project would be to implement such a GUI in KDE, at the very least supporting pulseaudio but optionally supporting ALSA or other audio frameworks as well. It would be part of the multimedia KCM module. The tool would include two components. First would be a multi-channel calibration tool, with test sounds and individual volume controls for each channel in the same interface. Once the channels have been calibrated, the ranges for the kmix volume sliders for the channels would be automatically re-scaled to hide these changes in the normal kmix interface. KDE already has a KCM module for testing surround-sound speakers, but this tool doesn't allow you to configure the channels. It also lacks features found in other such tools, like being able to play sounds from all speakers in sequence. The second component would be a point-and-click interface for connecting software sound channels to physical sound card channels, as well as connecting sound card channels to other sound car channels or software channels to other software channels. This would be particularly useful for people with custom speaker set-ups or that are using multiple 2-channel sounds cards to implement surround sound. It would also be useful, for instance, for routing microphone devices directly to speakers, routing stereo sound to multiple speakers in a surround-sound setup, combining channels from multi-channel sound for stereo speakers, or routing sound from production software directly to recording software. There is currently no GUI for this in Linux at all that I am aware of, so this would be a big help. Expected results: An interface for calibrating surround-sound speakers, and a tool for connecting audio channels to other audio channels. Brief explanation: The git master version of PulseAudio (to be released as 1.0) contains an "Equalizer" sink that acts as a filter on top of a hardware device. By extending how the existing PulseSupport class works in Phonon it should be possible to provide access to such equalization to any backend. At present, when PulseAudio is in use, Phonon will already bypass the backend when dealing with volume changes, utilising PulseAudio's per-stream volume controls. It is expected that presenting the equalizer sink would be done in a similar way. Expected results: When present, equalization will be presented to the user via Phonon. Knowledge Prerequisite: Qt/C++, Knowledge of PulseAudio would be a plus. Knowledge of Asynchronous programming principles would also be desirable but not essential. Brief explanation: Phonon has a very distributed project structure. Playback capability is actually provided by so-called backends which act as plugins to the Phonon library. Every supported multimedia framework has its own backend. This causes an interesting situation with regards to automated testing and quality assurance. While there is a set of unit tests in the Phonon library itself, they are incomplete and only test a fraction of the available capabilities. A new more scalable testing framework/setup is needed to ensure all backends act according to the expected behavior outlined by the Phonon library. Expected results: A testing framework to quality assure backends. Expected results: A new well documented implementation of the code folding. Main design goals should be maintainability, performance and simplicity. Brief explanation: Kate supports versatile scripting in its part. This is for example used for the indentation scripts and some of the commands available in the kate command line. Still missing is any real integration into the Kate GUI which allows easy creating of new script, debugging them and for example binding the interactively to shortcuts. The goal of this project would be to implement a Kate application plugin which provides the user with the means to edit, debug and run scripts for the kate part. In addition the interfaces to the kate part should be extended to allow access to the scripting features. For example the plugin could provide auto-completion for the scripting API or/and a own highlighting for kate js scripts could be done. 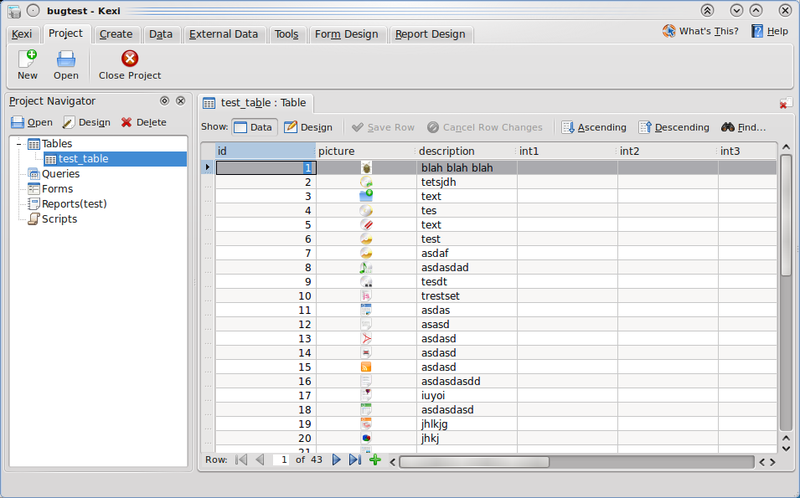 Expected results: A Kate plugin providing some scripting IDE to create and debug kate part scripts. Improve the actual session manager (actually just used to restore tabs on crash or on startup) to support the session saving mechanism. Add support for pinned tabs that are visible accross sessions. Brief explanation: Create a web interface for viewing and editing PIM data stored in ownCloud. Expected results: Creation of a web interface that integrates in ownCloud, the interface should provide read/write access to calendar and contants that are stored on the ownCloud server (probably as vcard/ical files). It should provide a feature set as closely to desktop clients as possible. Brief explanation: Create a method of sharing files and other things with users on the same ownCloud server. Brief explanation: Umbrello UML Modeller uses the old and limited Q3Canvas class. Flake Calligra Flow  (formelly Kivio) has very much similar graphics capabilities as UML Modeller. Expected results: A stable Umbrello using Calligra Flake, sharing code with Calligra Flow. Brief explanation: At the moment, KDESDK includes Dolphin plug-ins for the version control systems Subversion and Git. They provide a GUI to access the basic functionality of these VCSs via context menu entries. The current versioning state (e.g. "locally changed" or "conflicting") is also displayed through icon overlays. To complement support for the major systems, this project aims to implement such a plug-in for Mercurial. Expected results: Version states are displayed correctly. Basic Mercurial functionality is accessible via the context menu. Intuitive dialog design. Profound knowledge of Mercurial concepts, commands and workflows. No knowledge of Dolphin source code required. Brief explanation: Okular currently can read the annotations in PDF documents, but it cannot change in any way the ones in the documents -- meaning add, remove, and edit. This is due to to limitations in the Poppler library, which lately got very few annotation editing capabilities, with none of them being exposed through the poppler-qt4 frontend (and so usable by e.g. Okular). The task is to work on either Poppler to allow to edit annotations in poppler-qt4 (possibly enabling more editing options in the poppler core), and to make Okular able to make the changes in the PDF documents, taking also care of the annotations currently stored externally. Expected results The possibility to change/edit the annotations in a PDF document, and to edit more annotation options in Okular. Mentor: I will try to participate as a student this year, so I can't be a mentor and I'm looking for someone else. Knights' current codebase is quite small and not complicated. I'm available at Miha Čančula. Brief explanation: Gluon Creator is designed to be usable by people who are not programmers, and as such the version management integration has to be simple. Aleix Pol has created a system used in KDevelop which is powerful and very useful for programmers, which we suggest is used for advanced version handling in Gluon Creator. This would then be exposed more directly in the user interface, creating a work flow which assists in the use of the version control system. Brief explanation: The Gluon Input system is designed to support multiple back-ends for optimal integration with the underlying system. Since its inception, a system based on evdev has been used. This system proved to be cumbersome due to evdev devices only being accessible by the root user. A fallback system was created using the input handling in Qt. However, Qt does not distinguish between multiple devices and also does not support specialised game input devices like joysticks. The primary goal of this task is to create a back-end for Gluon on Linux that uses the XInput2 extension for X for device access. This extension provides support for multiple devices to X windows and is currently being built upon for multi-touch support in X. Ideally, this back-end would expose all available input devices to the Gluon Input system and support adding and removing devices based on connect/disconnect events. A secondary goal would be to have this input information available in Gluon Creator and games built using Gluon. A Gluon Input back-end based on the XInput2 extension. If time permits, enhancements to the user-facing side of the input system that enable multiple devices to be used by game developers. Knowledge prerequisite: C/C++ development experience using Qt. Experience with development using X and related libraries is a definite advantage. simon is an open source speech recognition system using many parts of the KDE infrastructure. You can find out more about us on our homepage, blog or the development site. There is also a demonstration video on youtube. Brief explanation The speech recognition system simon is currently based around the concept of being individually configured for each application that is going to be voice controlled. While this works fine for smaller installations it gets tedious in the many cases where no special configuration is needed and the user "just" wants to browse application menus, select buttons, etc. simon could parse this information of running programs, generate the necessary vocabulary, grammar and commands to trigger any on-screen buttons, menus, etc. This would give simon control of running Qt and GTK applications without any specific configuration and greatly enhance the use of simon in a full-fledged desktop. Expected results A simon plugin that listens to AT-SPI messages on DBus and exports the necessary vocabulary / grammar / commands. Contact Besides myself personally (grasch@simon-listens.org) you can also contact us at office@simon-listens.org and through the forum on our developer page. Resources The command infrastructure is heavily documented (an older snapshot can be found online). Brief explanation As speech recognition is at its core a statistical analysis, recognition accuracy decreases as more "candidates" need to be considered. Therefore a system that only distinguishes between the numbers from 1-9 will always work better than the same system trying to differentiate between hundreds of words. In short: It's easier to separate "One" and "Nine" than "One", "Con", "Oh", etc. In a speech control scenario only a couple of commands are relevant in each context. simons scenario system could be used and combined with a newly developed context recognition system (probably based on running applications or even the current activity as exposed by KDEs activity system) to deactivate words when they are not needed at the moment. Expected results Context recognition system and an extended simon / simond protocol to relay context information. The scenario format and UI would also need to be adapted to allow the user to define in which contexts the scenario should become active. The result would be a greatly improved recognition performance in almost any practical use case. Brief explanation The voxforge project aims to create GPL acoustic models. Using these models, simon does not need to be trained at all to work. The models are speaker independent and - at least for English - are already good enough for fairly accurate recognition. To further improve the Voxforge models (especially for other languages), the Voxforge homepage provides a Java applet to submit new speech by recording voice samples. However, users do not get a direct benefit from contributing voice to the project. By integrating Voxforge in simon, users could train their local Voxforge copy and submit the collected samples to Voxforge. They would directly improve the recognition for them personally but also help to further improve the general Voxforge model. To sum up: A lot of users already train their acoustic model locally. If we could gather all that data in a convenient way for the end user, the general model would rapidly improve and end-user training wouldn't even be necessary in most cases anymore. The KDE WWW encompasses not only the KDE Forums, but also Userbase, Techbase, the Community Wiki, Documentation, many International Web Pages, Mail lists, News, the Planet, Git, and others, housed on multiple servers. More details here. Brief explanation: Create a username mapper with some form of a UI on the identity and wiki/forum, etc. sides. The most generic way to do it would probably to have special ldap properties for each of the various properties that already has its own user db (wikis, dot, forum), then have an agent running on those servers which can access their dbs. Users would then go to identity, open a "username mapper" module, the agent would then check to see if the username was in use. If it is, the user then gets to select a username from a list of available generated names or map to a pre-existing username if the emails match. KDE users will be able to manage logins to all KDE web resources using Identity. Users would also be able update emails and other user details when they change as well. Knowledge of how KDE Identity works, plus the software it bridges with, coupled with how to write a daemon (probably in a scripted language) which has to accept possibly invalid user input. When the KDE repository was on Subversion, applications and libraries were organized in modules: kdelibs, kdeworkspace, kdegraphics, kdeutils, etc. Think of a module as a "suite" of somehow-related applications, libraries, and everything that was needed to build them (build system checks, configuration, etc). In order to build an application belonging to a module (for instance, KSnapshot, which was in kdegraphics), it was necessary to checkout the source for the whole module and run CMake against the module. Building a single application initially impossible, although later it was made somewhat possible through certain tricks Alexander Neundorf implemented in the build system. KDE on Windows uses its own package manager (emerge) to build and install KDE and the third-party dependencies KDE needs. At the moment, it builds and installs modules, not individual applications (save for some exceptions). This task is important to achieve best results in the next proposed task. This is actually a fairly easy task and even if you only have a general knowledge of computers and software development, you can probably learn what you need in a couple of weeks. TBA. Patrick Spendrin? Pau Garcia i Quiles? The installer is Cygwin-like, whic is very different from the normal InstallShield, NSIS, MSI, etc installers. Your task: create a new installer, something which looks much more appealing and easier to use. The Apple Mac AppStore is a good example. You can probably re-use most of the download and package management intelligence from the current installer. A new, installer. It should consist on a SINGLE executable, i. e. it needs to be statically compiled. Desirable knowledge to understand why emerge and the current installer do what they do includes svn, git, Python, Windows, build systems (CMake, qmake, etc), compilers (gcc/mingw and Visual C++) and cross-platform concepts (esp. Linux-Windows). You can probably learn about this and how KDE on Windows works in a couple of weeks. As for the implementation itself, it does not really matter as long as you get the job done. The sensible option, and consistent with the rest of KDE, seems to be Qt (QtWebKit, QML, etc) but if you are a C#, F#, C++ CLI, etc ninja, we'll gladly accept you. The KDE Accessibility subproject aims to make KDE applications accessible to all users no matter the disability. Update the website with current information. Test and debug crashes in qt-atspi bridge itself. This task is important to help get KDE usable by anyone with disabilities. Desirable knowledge includes svn, git, dbus, QAccessible, etc.